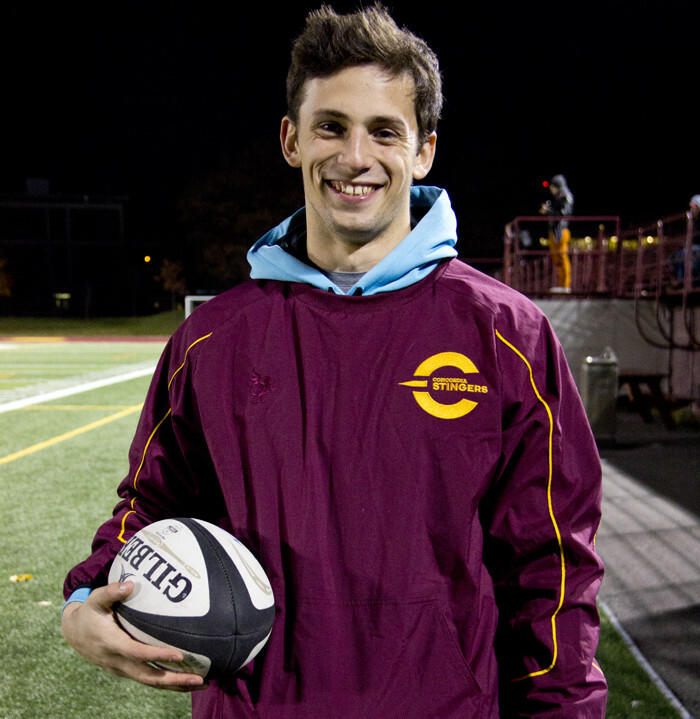 What started off as a bonding experience with his father has turned into a lifetime passion for Stingers rugby kicker Charles Debove. Not many rookies can boast that they’ve played in France, on Team Quebec and on Team Canada, but as Debove talks about his journey, it’s evident that he’s thankful for everything he has been able to accomplish so far, and his passion is obvious. “I just love the sport. I love the spirit,” the kicker for the team says. Born in Nice, France, Debove moved to Canada seven years ago and quickly became accustomed to Quebec. Though he started out playing soccer in France, he stopped after only five months because he didn’t find enough camaraderie amongst the players. Despite the fact that playing rugby required a bigger commitment, because the practices were far away, Debove and his family were willing to make the trek, carrying hopes of a successful future in the sport. When he moved to Quebec, he found himself alone with no rugby league near him. Debove found solace in football and basketball, which he took an interest in, but not for long. He is now committed to rugby—for better or for worse. Off the field, Debove is in the Vanier Library or at the Perform Center. He is currently studying psychology with the intention to focus on either sport psychology, or the sociological aspect of the program that will require him to work with people. When he isn’t practicing, he spends as much time as possible studying. Occasionally, he’ll spend time at his favourite café, Bano, located on Sherbrooke St.
On the team, he enjoys the bond that they have, and is grateful for the chance to play for his school as a centre. According to veteran Graeme McClintock, Debove is known as “superstar,” “Team Canada,” and/or “Team France” among his teammates. McClintock and Debove interact as friends off of the field. “Charlie is all that a rugby player is supposed to be in the sense that he’s got the skill, he’s got the talent to play the actual game on the field.” said McClintock. Debove has even gotten along with his equally talented compatriots on the women’s rugby team. “Off the field he’s social, always happy and positive, making people laugh and always wants to have a good time.” said McClintock. “I love being around the guys and even the girls. We all have this one thing in common and it brings us closer together,” Debove says. Playing for the Stingers, the centre’s self-esteem is high. He attributes this to the fact that he got to play for Team Quebec and Team Canada. Sure of himself, he feels more confident and loose enough to try new things on and off the field. Most athletes have pre-game rituals, including Debove. He doesn’t pull up his socks until he steps on to the field. During the warm-up, his socks are down, and right before kick off he pulls them up and reties the laces for his right foot only. The first couple of seconds bring a familiar feeling as the butterflies rise and Debove gets pumped up into his game-winning mentality on the field, and the rest of the season.